Facebook is officially embracing hashtags to make it easier for users to find specific content and conversations on the social media network. 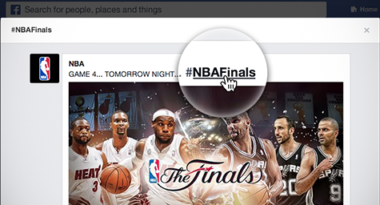 Many users have been posting hashtags on the site for awhile, but now Facebook is going to make them both clickable and searchable. Rumors have swirled over Facebook’s possible hashtag acceptance for the last few months, and now the talk has come true with the company gradually rolling out hashtag functionality in the coming weeks. Mashable.com posted details on Facebook’s formal embrace of the hashtag. Hashtags have become ubiquitous on the Internet because they allow users to discover topics of relevance or interest very quickly. They originally came to fame on Twitter in 2007 when user Chris Messina invented hashtags as a way to organize tweets around similar information. Twitter soon adopted the system into its API and overall infrastructure. The hashtag’s instant popularity led to its adoption by other social media services like Tumblr, Flickr, and even Instagram, which is owned by Facebook. Now six years after its debut, the hashtag has finally found a home on Facebook. The social network plans to make hashtags from the above-mentioned services clickable, as well. In addition, Facebook users will be able to create posts straight from a hashtag feed and quickly search results, which should make it simpler than ever to add real-time content to streams. With hundreds of millions of people having public conversations on Facebook each day, and up to 100 million Americans engaged on Facebook every night during TV’s prime time, there’s finally a way to get a general overview of the news and issues that have Facebook fans talking. With the arrival of hashtags on Facebook, the most popular conversations and pressing matters will be brought front and center to help users tap into the trends of the day. Keep up with Facebook and the latest in social media marketing. Contact MDG Advertising today at 561-338-7797 or visit MDG’s blog for more about Facebook.